Fleur released her makeup range a couple of months back, which consists of two eye shadow palettes, a line of lip products, lashes and a makeup bag. I took advantage of the current 3 for 2 offer they had on Feel Unique and finally purchased this palette I adored the look of plus a few bits for my best friend. Packaging: When I first watched the video of her explaining the products, I really took a fancy to the packaging. It kind of reminds me of the Mac quads and as it's black it's simple yet rather sophisticated and professional. 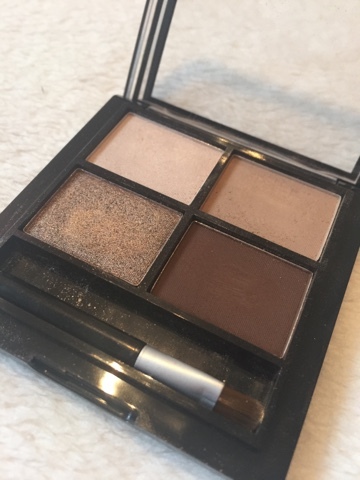 The see through lid I adore because you're able to know exactly what comes in the palette. 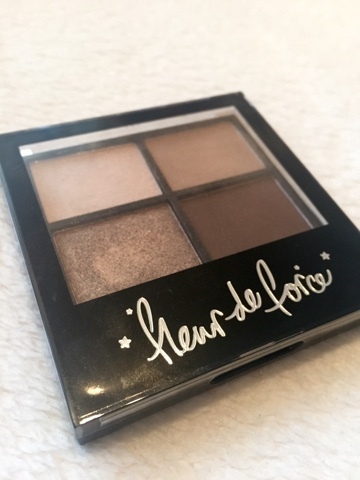 The size is absolutely perfect, small enough to travel with and take on the go with an array of versatile shades - I love it! 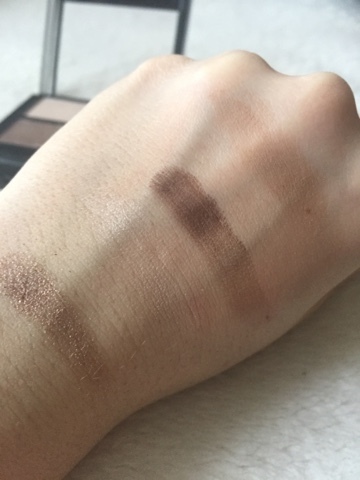 Pigmentation: Initially I wasn't sure what to expect in terms of the eyeshadow's quality but when I began swatching/applying, I was genuinely surprised. All four shadows are beautifully pigmented where only a little bit is needed to get the true colour. For me, it's up there with Urban Decay's eye shadows, especially the dark brown, a.k.a the most perfect definition colour ever! Colours: The palette is made up of four bronze based shades hence the name 'Cosmic bronze', perfect for someone like me who adores bronze/brown/neutral colours. Going from left to right you have a gorgeous cream, slightly pink toned highlighting shade, a complete light matte brown colour, perfect as a transition shade, a shimmer bronze with slight silver/pink undertones and a dark matte brown. I love the combination of all four of these together or just using two for a truly natural look; the colours range greatly for many neutral makeup styles. Below I have swatches of the palette ( from left to right): Shimmer bronze, highlighting shade, dark brown and light, tan brown. Application and lasting power: From the first application I found the colours to be very rich especially the bronze shimmer and dark matte brown. The shimmer shade when applied is beautifully pigmented, yet isn't overpowered by too much glitter, holding the perfect amount of sparkle. The two subtlest colours are the highlighting shade and matte brown which I love. 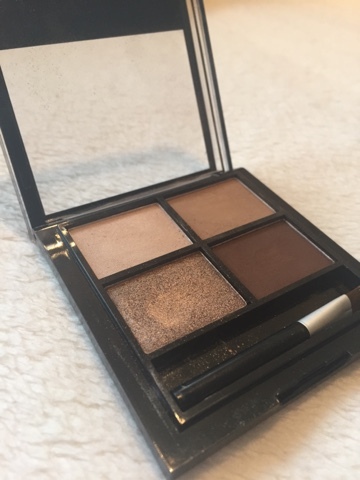 You're able to create a natural highlight on the brow bone/inner corner and with the light matte brown, it's a lovely colour used as a transition when blending shadows or to contour the eye if going for a more everyday look. In terms of lasting power, with a primer these shadows really hold in place for the majority of the day, keeping to their colour. I'd say towards the end of a working day, they begin wearing off, yet the quality still shines through. As I've really been enjoying this palette recently, I thought I would share with you a look ideal for any party/celebration occasion and even Christmas! It's a simple combination of all the colours, resulting in a shimmery neutral eye look which I paired with a berry lip. I applied the bronze shimmer shade all over the lids, took the lighter matte brown through the crease and blended the darker brown in the outer corner. I then used the highlighting shade and lightly dusted on my brow bone and doted it in the inner corner. 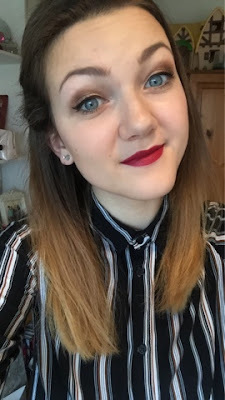 The lipstick I chose to complete my makeup was the berry classic, Rimmel's Kate Moss 107. 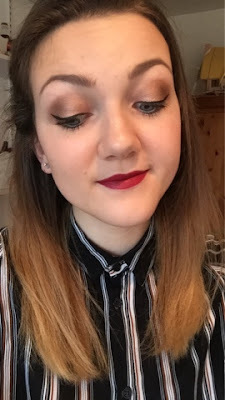 I hope you enjoyed this review and makeup look! Have you tried any of Fleur's products? Merry Christmas to all my fellow readers and bloggers! 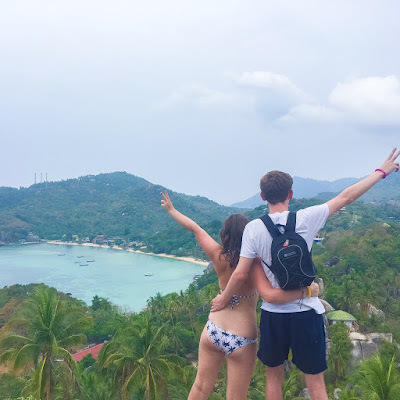 Fleur is the only bigger blogger/youtuber that I have any time for and I've been waiting to read a review of this!! I'm so happy that it's good quality :) I'm definitely going to have to invest in one of these now. Also your eye makeup is stunning, you look lovely! (P.S that lipstick. I need it in my life now!) Can't wait to read more from you!! That shimmery brown really suits you!